I think it’s time to create a new series here on the blog. Nothing weekly, but something every so often where we can all chat about FOOD! I’d like to call it, “Let’s Chat About…”. The first topic I wanted to chat about was milk, specifically dairy-free and plant-based (obviously). So let’s chat! The dairy industry is horrible. There is nothing else to say. You all know I am dairy-free and choose to be because of ethical reasons being number 1, and some sketchy sensitivity results. I finally got around to typing up a tummy update for you guys! I know you are so excited, the perfect way to start your Thursday 😉 But that is what blog are for right? To read, listen, share, over share, and love every minute of it! You can read my two original health posts here and here. Lets just jump right in shall we. I have to say, I have made some awesome progress in the stomach department. Obviously I am all good with the gluten-free (4 years and 4 months now), still have my soy allergy, and still eat vegan except for fish and chicken. Easy peasy. But What I have added back in (slowly at first) but now I have been pretty crazy with are cruciferous veggies (broccoli, cauliflower, etc.) and acid filled wonderful veggies (my favorite baby yellow grape tomatoes, a little bell pepper, etc. ), and tons of greens and lettuce. O how I missed those wonderful veggies. I can’t get enough and now I see how limited I was in the veggie department when I couldn’t eat them. They would cause horrible bloating, gas, and pain, and then acidic veggies would cause extreme acid reflux. But I think my stomach is finally being more welcoming. (I even drink some caffeinated tea sometimes and have been eating more oats!) However, if I eat to many tomatoes, especially bell pepper, the acid shows up, but I can deal with a little pepto, Maalox, or gas-x for the other veggies. So on to my medicine consumption. I had been taking daily 20mg of prescription Prilosec (in the morning and then an 20mg of an OTC acid reducer before dinner) for many years, but I hated it and still do. It is terrible for your bones and I am against prescription meds in the first place. No teenage girl should have to be on it. So I was determined to whittle that crap down. I started skipping the Prilosec every other day and would replace it with two 20mg OTC reducer. Then I just kept skipping more and more days. So the days I don’t take Prilosec, I take two 2omg OTC reducer in the morning, and then two more 20mg OTC reducer before dinner. Usually around 2 o’clock I feel the acid start to build up, but I usually can get past it and if it is really bad, I will just swallow some Maalox. I can now go without Prilosec for about 4-5 days at the longest. I feel good about it and hopefully with more work, I will be able to stop it completely. Obviously if I really wanted to get off it quick, I would reduce the acid causing foods…but I really don’t want to again so I will deal! So in the above picture are my morning vitamins and herbal supplements. Because I slowed down the Prilosec, I wanted to try healing my stomach with some herbal remedies. 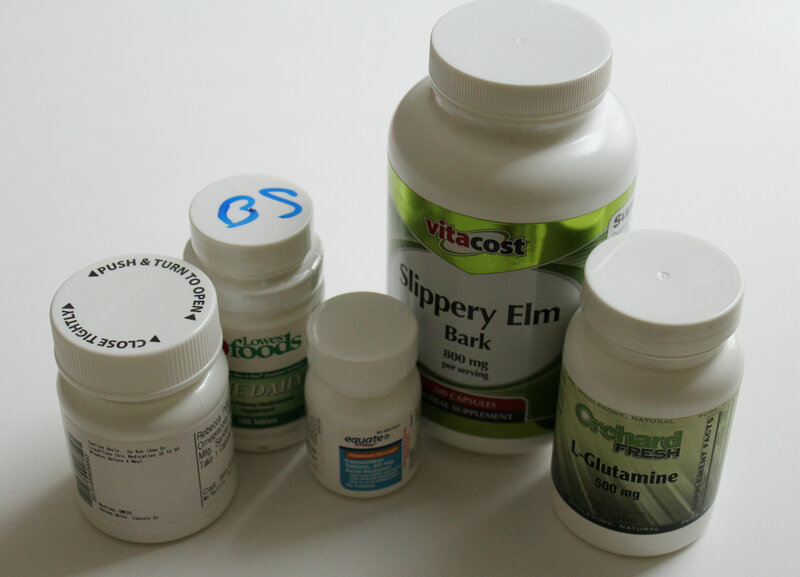 I have heard great things about Slippery Elm and L-Glutamine so I gave them a try. I love Slippery Elm! It was the first one I tried for a few weeks before I added in the L-G. I really did notice a difference in my stomach and digestions. I just take 800mg a day and it works!. The L-G is 500mg and I don’t know if it was the same amazing effects of the Slippery Elm, but I am keeping that one in too. Then You have my simple daily multivitamin which I take every other day, it has all the B vitamins, A, C, and the other normal stuff. Then the white bottle is the prescription crap, and the little white bottle is my OTC. These are my dinner time supplements. I take a 5billion culture pro-biotic. I have also added in sauerkraut once or twice a week to my diet to get even more goof cultures in. Then my extra B-12. It is only 100mg, but since I don’t eat gallons of meat, it is safer to get an extra boost. Then my calcium plus D. I recently switched to calcium Citrate since that is what my dad can get his hands on at the vitamin factory where he works. I used to take Caltrate, but it was expensive and unnecessary if I could get these calcium pills for free. Citrate is easier for you stomach to digest, but harder to find and more expensive. I only take 1 Calcium pill of 600mg and 400mg of D. I have tried taking two, but it tends to bother my stomach. Then I take another extra Vitamin D-3 pill which is 400mg. Last is my newest addition of Magnesium. 3 pills is 4oomg, but I only take one. I have heard great things about Magnesium as well and how it boosts mood and helps the stomach. As for the acid-reflux, I think with more time I will continue to heal, but I do have that condition where the flap that opens and closes to keep out acid, never fully closes on me (sorry for the kindergarten description!). So unless I bite the bullet and get crazy surgery (unnecessary in my book) I will always have reflux. That is my quick update. I am doing pretty good but still need work. I am really trying to focus on my diet and even gain a little weight. I think once that is accomplished I may start to feel even better. Gaining is really hard and I still don’t know how much I do weigh, but after a recent doctors visit and blood work (I hadn’t been to the doctors for a physical in like 1 1.5 years), it became apparent that gaining weight was kind of necessary. So now I have that on my plate as well, but I am trying even though it can be very very difficult mentally at times. I know I am eating extremely well and healthy. I just need more calories, more fuel. I am trying to eat a little more of this, a little more of that, more nuts, seeds, granola. Things that you don’t need a lot of to get in the calories. But man, it is hard and not very fun. On the bright side, if I am successful I will be able to gain more muscle, make my workouts more effective, and have enough power to start running. Keeping it positive! 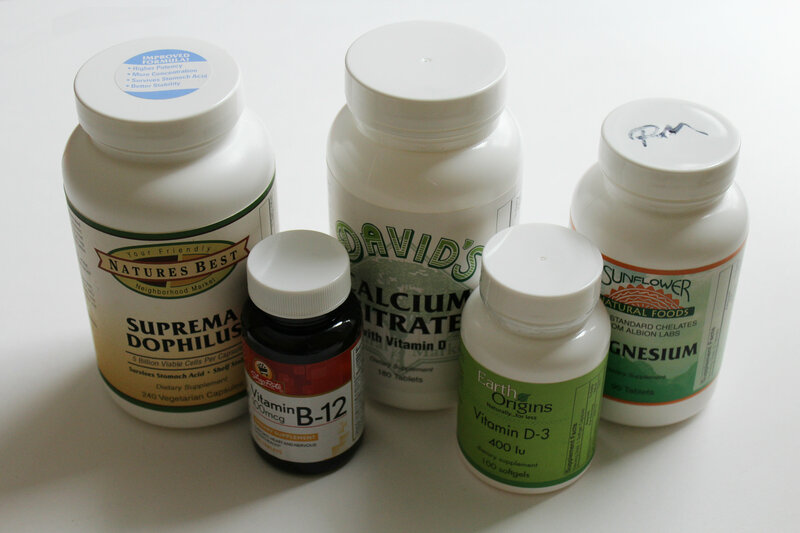 Do you take a natural supplements/vitamins? Any other supplements you have felt really benefited your digestion that I should look in to? I linked Meg’s digestion posts last week in the finisher and she did another one this week and mentioned taking digestive enzymes. I might want to give them a try. Have you ever taken them?